In the arcades, House of the Dead impressed with a few new twists on the shooter formula. Instead of the one-shot one-kill mentality that existed in most shooters at the time, HotD included zombies that wouldn't stay down after only one bullet. The undead would just keep coming, despite losing their limbs or chunks of their bodies. HotD also introduced multiple pathways, as certain parts of the each stage contained extra twists and turns, opened by rescued hostages or hidden switches. With another arcade success up their sleeves, it was inevitable HotD would find its way to the Saturn. And that it did in 1998, at the very end of the system's life. Is it still a success? To get straight to the point: Not really. 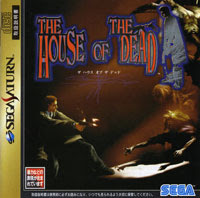 While it is still technically The House of the Dead on the Saturn, it really doesn't look like it. The graphics are bad. Really bad. This is one of the worst looking games on the Saturn. Polygons have been removed, as expected in a Model 2 conversion, but the level of detail that has been dumbed down is just nasty. The textures used in this game are just awful, pixelated messes that at most times bear very little resemblance to their arcade counterparts. Everything blurs together in a muddy mess of brown and gray, making it hard to spot enemies. Not too mention, this graphical mess is a clunker, too, chugging along at a very poor frame rate. Even though the graphics are bad, it wouldn't be too much of a problem as long as the game still felt like it did in the arcade. Unfortunately, that's not the case. The low frame rate makes the game harder to play than it should be, causing players to adjust to the poor graphics, rather than develop zombie-shooting skills. The Stunner gun feels really unresponsive, which is a shame, because it's one of the most accurate light guns I've used on a home console. 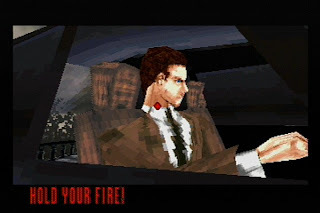 Sega has demonstrated with the Virtua Cop series that a smooth frame rate and responsive gun control are completely possible and should be expected, but it just doesn't happen here. It seems that the poor frame rate causes the game to register hits slightly slower, and because of that, nothing feels precise. Just to double check and make sure that I'm not just sucking, I went back and played through Virtua Cop 1 and 2. No problems there. I tried adjusting the gun calibration, but it didn't seem to help. So, I went to the next logical stepped and plugged in a controller. Oddly, enough, when using a controller, the targeting reticle moves around at a good 30 frames per second while the rest of the game stutters along. The end result is that the game is actually easier to play with a controller than with the gun, which pretty much defeats the purpose of games in this genre. The home release includes, in addition to the standard arcade mode, a new Saturn mode, where different characters can be selected. The difference between these characters include the number of lives they have per credit, how many rounds they can fire before reloading, and how much damage their guns can do. Does it add to the game? If you master arcade, it could be fun to mix it up a bit with these options, but ultimately, it's still the same levels. Lastly is a boss mode, which could be good for practice on a problematic boss, but personally, I've never had the desire to replay the bosses outside of the normal game. All in all, I'm really disappointed with this game. It should have been another classic Saturn shooter from Sega, but it just ends up being a let-down. It appears that half-way through the game, development just stopped and whatever was done was released. If the poor graphics didn't affect the controls, it wouldn't be as bad, but the low frame rate makes precision targeting and reactions really hard with the gun. Unfortunately, HotD without the gun is like a dog without a bone. There may be no final justice for this game. 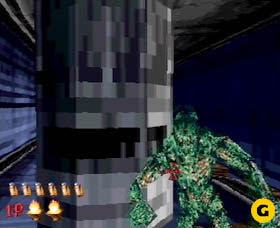 It was set to be an unlockable in the Dreamcast's House of the Dead 2, but was cut due to time constraints. Supposedly it was to appear in the House of the Dead 2&3 Return on the Wii, but the graphics were deemed to be too aged. Collectors are looking for this game, so if you really want it, I'd suggest going the import route. The Japanese version is pretty cheap and besides about $60, the only difference is that all of the blood is green instead of red. PDS has quite possibly become the most notorious game on the Saturn, and for good reason, too. Released in 1998 at the end of the system's life, the game was only available in limited numbers. Its rarity was a problem even then, and as a result, I've had the fortune of buying the game twice, the first being at a Toys 'R' Us in 1998. At the time, Toys 'R' Us kept almost all of their games locked up and in order to purchase one, a price tag that hung just outside of the case had to be taken to the check-out counter. After paying for the game, the receipt would be traded for the game itself, which was kept in a separate, locked room in an attempt to minimize theft. I'd been keeping an eye on the game, and there were never any tags available, as the game was out of stock. One day, luck had found me. There was one tag left. They had received a new shipment and I had managed to snag the last remaining copy. I went to the counter, paid the $59.99 and then went to trade the receipt for the game. But wait, there was a mistake. They didn't have Saga. Did they put too many purchase tags out? Did some cunning employee know the value of the game and take it? Regardless, I went home empty-handed and never saw the game in stores again. So, 10 years later, after the asking price for the game had nearly tripled, I bit the bullet and picked it up. Saga begins as a young guardian, Edge, and his fleet are attacked on an ancient ruin they are protecting. In the attack, Azel, a mysterious girl buried in the ruins for centuries is stolen, presumably to be used for evil. Left for dead, Edge is nearly ripped to shreds by ancient biological creatures, until a dragon shows up to save the day. It is mere coincidence or destiny as the dragon chooses Edge to be his rider? The story begins and after a 10 minute long intro movie, so does the game. Instead of immediately hopping on a dragon and blasting away, Saga turns the series around and eschews its shooter roots in favor of an RPG/strategy format that's broken into sections of dragon riding, walking, and battle. Moving from one spot to the next is done by hopping on the dragon and taking it for a ride. This time, instead of just following along on rails, the environments are free flowing to allow for exploration of the area and its surroundings. Environments usually come in one of two forms, either completely open or very cave-like. The cave variety does well to get the player from point A to point B, but sometimes seems too linear. Free-form open spaces, on the other hand, don't have this same problem. Along the way, there are objects to shoot at, some containing items, some triggering events to progress the story, and others that are merely there for scenery. 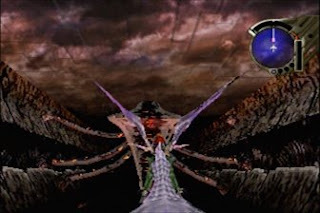 The majority of the game takes place, here, on the back of the dragon. For the most part, it's easy to control, with a button for managing speed and the the analog pad handling the direction. Occasionally, bumping into an object will cause the dragon to hang or repel off of it in a bizarre fashion, but since this mode is primarily used to transportation and not quick-reaction battles, it's really not a big deal. Walking sections are done sans dragon, controlling only Edge. This is the typical exploration area, with the character walking around talking to people, collecting information, and furthering the plot. While Saga uses the analog pad, it doesn't really take advantage of it. To run as Edge, instead of just pushing the pad a bit more in the specified direction, the B button has to be held down. This stays consistent with dragon riding portions of the game, but shouldn't be necessary. To look at an object, first the action button has to be selected, and then a target appears on the screen. The item can only be inspected after "locking on" to it. Again, this is fine on the dragon, but seems excessive when on foot. The walking environments aren't exceedingly large, and there really isn't a huge cast of characters, despite all of the different locations in the game. It creates a very isolated feel - as if it's Edge, the dragon, and just a couple of others. Upon further prodding, many characters open up and there are several subtasks and conversations available. When walking around, time of day changes, and of course, the people who are out and about change as well. This helps make the Saga world a little more alive, and also adds more replayability to the same area. Most of the action, though, is in the dragon battles. These battles are rooted in classic turn-based RPGs, but rather than the "I attack, you attack" strategy, PDS incorporates time into the mix. The dragon has a total of three gauges that fills up one at a time. 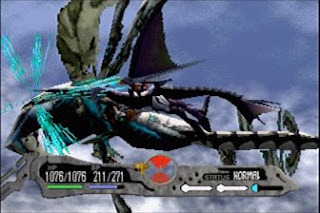 Once the first gauge is filled, the player can fire the dragon’s lasers for a general attack or Edge's gun to target a specific area. After two gauges fill, berzerk attacks, the equivalent of magic, become available. A full three gauges will allow special berzerk moves and a few extras to take place. But, there's a catch - the gauges only fill while the dragon is staying still. Each enemy has a radar around it and the dragon can locate itself in one of the four (top, bottom, left, right) positions. These are marked as red (dangerous), green (safe), or uncolored (neutral), depending on the severity of the enemies' attacks in these directions. As with the dragon, each enemy uses the same gauge system to determine when and how often it can attack. The result: battles that require some strategy and positioning, as well as good timing. This can keep players on their toes, making decisions such as "Should I wait another moment and try to fire off the last shot or should I just move out of harms way? Will this gauge fill in time so that I can use an item to restore my health or am I toast?" The bad news is that once an enemy is figured out, it's pretty easy and repetitive. As with other games in this genre, the characters can level up, gain experience, grow, and generally get bigger and badder. After finishing a battle, the game rates the player on their performance. Higher ratings mean more experience and more items. Lower will mean less. After gaining enough points, the characters level up and get stronger, learning new berzerk attacks along the way. There are several berzerk categories and what attack the dragon will learn is based on its current form. The dragon itself can be morphed between four different types - attack, defense, spiritual, and agility - as well as the standard all-arounder. Certain types are better at certain enemies, and well, sometimes it's just nice to look at something different on the screen. 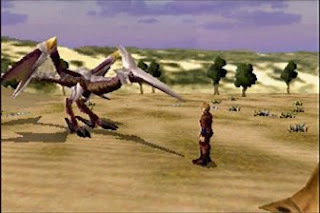 After reaching certain portions of the game, the dragon will change forms entirely, just like in Zwei. These new forms come with additional upgrades as well, for laser attacks, health, and berzerk ability. Though it's all fun, the game system and mechanics are good, but not particularly great. I enjoyed the battles, but I hadn't felt drawn to play against those creatures again. Of course, I'm looking at this 10 years after it was released, which may have tainted things for me a bit. But what keeps people talking about this game so many years later? Graphics-wise, this is one of the better looking games on the Saturn. Zwei had some very nice water and transparency effects, but Saga takes them to a new level. The Saturn was never known as a 3D powerhouse and having no hardware support for 3D transparency really drove that point home. Saga, however, uses a few 2D (Mode7) transparency tricks to really give the game a nice shine. Water effects and the dragon itself are particularly spectacular in the game. Despite this, the environment textures are a little ugly. It's not House of the Dead ugly, but every once in a while, a wall will be pixelated top-to-bottom. Others have complained that the character models are simple and low-poly, but I haven't seen anything that would upset me for a game from this time period. Saga runs in the Saturn's standard resolution mode and has proper light sourcing, which is put to use nicely as the levels transform from day to night. Shadows on the characters change, and the overall tone of the skies go from blue to orange to black. Not only is it a nice tech demo for Sega's system that couldn't, it really helps give the appearance of a living world. The music is on another level. As with Zwei, the music in this episode of Panzer Dragoon is done by the Saturn's onboard sound chip. The composition is quite good, as the pieces are reminiscent of atmospheric tunes in Zwei. The numbers play throughout the battle and flight sequences, ranging from completely ambient to large and engrossing. It is definitely put to great use here, creating a moody and dramatic backdrop in the somber Panzer Dragoon world. But while the music and graphics stick out as high points, the story and universe are what’s truly engrossing. This has always been the strong point of the Panzer games. A world within a world, the story, the architecture, the artistry of design have all added up to create an environment that feels immersive. The storyline for the entire series isn't just tacked on to justify what happens on the screen. At the end of the first two games, I watched the dragon destroy whatever tower it was fighting at the time, and then I tried to figure out what the hell was going on. There was more to the Panzer world, I just didn't know what it was, and the story was intentionally vague. Saga takes that intrigue and slowly spells out the larger picture. 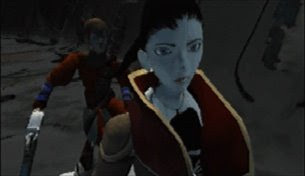 The storyline ties in directly with Zwei, and though it tries to tie in with the first game as well, it's safe to just ignore the storyline of the original Panzer Dragoon. 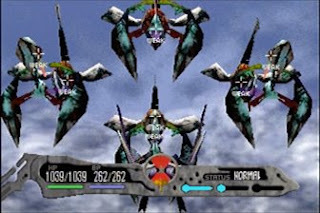 As Edge seeks revenge against the mysterious Craymen who attacked his village, he and the players learn more about the Panzer Dragoon universe. Why dragons exit, where they came from, what became of the other dragon riders are all subject matter in the game's story. The answers aren't handed out, but alluded to and hinted at throughout the journey. There are a few characters to meet along the way, but not over abundantly so. They fit into the PD world and give a glimpse of life when there's no dragon chasing down strange things. Throughout the story, as more and more questions are answered, just as many are asked with the appearance of Azel, a relic of the past. It all culminates as a tale of fate and destiny. The end of the game feels not like winning an entire war, but just a battle. There's not an entire civilization cheering for Edge as he triumphantly marches down the streets. Instead, the rest of the world could be oblivious to the battle that has just taken place, while those involved are deeply affected. This is the game that ended the Panzer Dragoon trilogy. As unsettling as it may be, it is still the end. When it's all over, the journey is rather short. Even with some trouble along the way, it only took me about 20 hours to finish the game. After playing through it once, a box game is unlocked, but this time around the extras aren't really worth anything and hardly add any replay value. I was compelled to play through the game at length again, and there were a lot of conversations, stories, and literature that furthered detailed Saga's universe that I had missed. Seeing all of this definitely adds to the experience, but once everything has been seen (and while not likely, it is possible to do on the first try), there's not much reason to go back. So, back to the big question: Is it worth it? 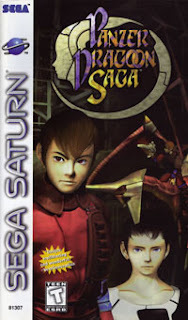 Panzer Dragoon Saga is definitely a good game and a highlight for the Saturn. The bad news is that it's still an exclusive to the system. Though it's probably not worth the asking price, it is still a game any Saturn owner would be proud to have in their collection. If there's a reason that I haven't been playing the NFL 2k series, I think I've found it. And for the record, it's just a marketing gimmick - a very interesting marketing gimmick, nonetheless.